Project Manager of Öko-Recherche GmbH and former spokesperson of the European Business & Biodiversity Campaign (EBBC). Sven Stöbener | Project Manager of Öko-Recherche GmbH and former spokesperson of the European Business & Biodiversity Campaign (EBBC). A revolution of economically and environmentally efficient products has started with PUMA’s InCycle collection, writes Sven Stöbener. Last spring, sportswear giant PUMA launched its InCycle collection composed exclusively of biodegradable and recyclable clothes, shoes and accessories. The impact all products from this new line have on the environment will be much smaller than other conventional PUMA products. Before developing the InCycle collection, PUMA started calculating its environmental costs according to a Product Environmental Profit and Loss Account (Product EP&L). The Product EP&L looks at the greenhouse gas emissions, water consumption, air pollution and land use throughout the production and consumption of the products along the entire value chain. It also includes the production of raw materials such as cotton and leather. The PUMA Product EP&L identifies the environmental impacts of conventional products and compares them with more sustainable items and helps people judge whether one shoe or shirt is more environmentally friendly than another. 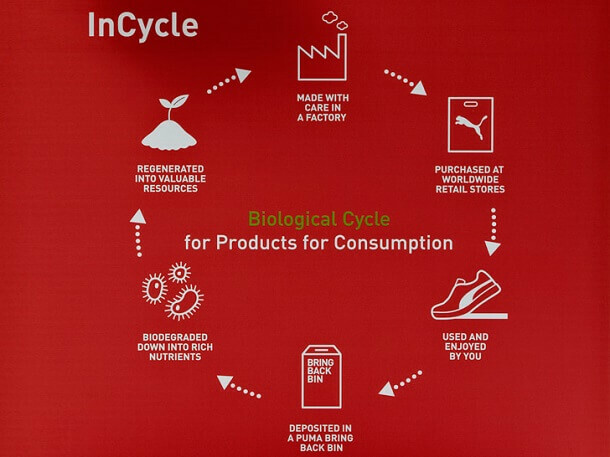 PUMA used this analysis with two of the upcoming biodegradable InCycle products, the basket shoe and the organic cotton t-shirt, and compared them with the classic PUMA suede trainers and a conventional cotton t-shirt. The result was that the InCycle shoes and cotton t-shirt impact the environment is 31% less than the standard products. 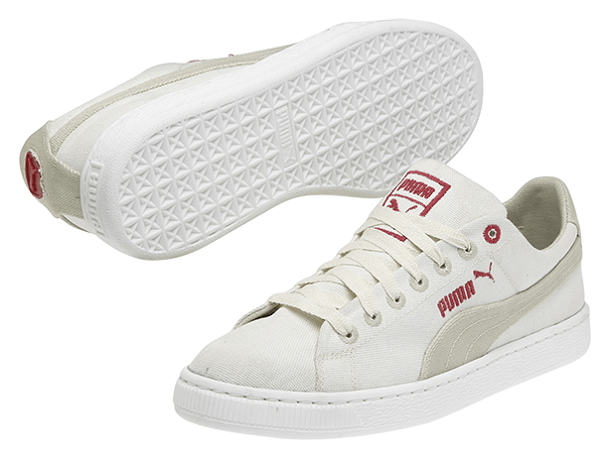 PUMA’s environmental costs amounted to €145 million, which is equivalent to about 72% of the company’s profits in 2010. About 30% of the external costs are apportioned to greenhouse gas emissions, as well as water and land consumption. The largest part of the environmental costs comes from the production of raw materials. The numbers also show the consequences of the outsourcing of manufacturing activities: 66% of external environmental costs are incurred in Asia. The most cost-intensive factor in its Product EP&L is land consumption which amounts to a quarter of the total environmental costs. These values per hectare are used to calculate the costs for cultivating natural rubber and cotton and for producing leather. The fundamental problem of insufficient assessment methods has therefore not yet been solved. The lowest environmental costs are caused through waste. PUMA even makes environmental profits with energy recovery and the associated use of less fossil fuels. Bio-degradable PUMA InCycle Basket. Source: PUMA. The raw materials that PUMA is using for this new biodegradable and recyclable line are organic fibers without toxic materials and can be broken down by microorganisms into biological nutrients. For instance, the sole of the Basket lifestyle sneaker is composed of the biodegradable plastic APINATbio – a new biodegradable material that can be shredded into its component materials before being composted into natural humus. The raw material follows certain international standards for composting to minimize their environmental impact. The recyclable products which include a backpack and jacket use homogenous materials, such as metals, textiles and plastic that can be reused to make other products. With the aim of becoming the world’s most sustainable sports lifestyle company, PUMA has also unveiled its in-store recycling scheme for customers. The biodegradable components of the “closed-loop” line can be returned under the company’s “Bring Me Back” program at the end of their life-cycle. This program facilitates composting or recycling of the products through the use of in-store recycling bins for used shoes, clothing and accessories of any brand. PUMA is taking the right steps to become a completely sustainable company. It is not only lessening the impact its products have on the environment, but also engaging its customers to make more sustainable choices for the benefit of our planet. The positive impact that PUMA’s products have on the environment will put pressure on companies to follow their example in making environmentally friendly choices in their production.